To estimate the number of workers affected by the Department of Labor’s proposed update to the overtime salary threshold, we use microdata from the Bureau of Labor Statistics’ Current Population Survey Merged Outgoing Rotation Group (CPS MORG). The DOL also employed MORG data to estimate the effects of its proposal, as is described in its Notice of Proposed Rulemaking (NPRM) (U.S. Department of Labor 2015a). This technical memo will explain our methodology, how we benchmarked our estimates to those of the DOL, where we deviate consciously from the DOL methodology, and what might cause discrepancies in our findings. Some differences are simply matters of interpretation, as explained by Eisenbrey and Mishel (2015a), due to our judgement that overtime eligibility has eroded substantially since the late 1990s while the DOL assumes no erosion of OT rights occurred. The DOL separately estimates how many workers will be directly affected by the proposed increase in the salary threshold (they are currently exempt) and those whose overtime protections might be strengthened (they already have overtime protections according to the duties tests but would now qualify for automatic overtime eligibility by virtue of their salary alone). Though we follow this approach in this technical memo for benchmarking purposes, we disagree with the premise that workers whose occupational duties suggest that they should be receiving overtime pay are actually receiving those overtime protections. This premise is embedded in the department’s use of estimates of the shares of workers in particular occupations whose duties make them eligible or ineligible for overtime that date to the late 1990s. These shares were converted to “probability codes,” whereby workers with similar chances of being ineligible (i.e., exempt from overtime protection because of their duties) are grouped into categories. Eisenbrey and Mishel (2015a) explain that the probability codes constructed by the Department of Labor in the late 1990s are outdated due to changes in the rules in 2004 under the Bush administration, various court cases, and employer aggressiveness in classifying workers as exempt from overtime protection. The administration counts these workers as those whose rights will be “strengthened” but does not include them in its figure of nearly 5 million workers who would be newly eligible for overtime. In the tables in this methodology, we categorize these workers as “strengthened” so that we can show how our estimates differ from DOLs, but in a separate issue brief (Eisenbrey and Mishel 2015a) we explain that we identify these workers as among the overall pool “directly affected” because most workers in this so-called “strengthened” pool will become newly eligible for overtime under the new salary threshold. In this technical paper, we first attempt to benchmark our results to those of the Labor Department’s by using the 2013 MORG data1 following DOL’s lead (we roughly follow Figure 2, “Flow Chart of FLSA Exemptions and Estimated Number of Potentially Affected Workers, 2013” in the NPRM). We show each step and the corresponding estimates for each group of workers in Table 1. We compare the DOL’s estimates to our estimates for 2013 and 2014. For the purposes of benchmarking our analysis to DOL’s 2013 numbers, we will reference our 2013 estimates throughout these steps. * The U.S. Department of Labor (DOL) pooled CPS MORG data from 2011–2013, inflating all wages to 2013 levels. a. It is important to note that the DOL definition of wage and salary workers differs from that of the Bureau of Labor Statistics (BLS). Unlike the BLS (2013), the DOL includes self-employed and unpaid workers. To avoid confusion, we adopt DOL’s definition of wage and salary workers for our methodology. b. Blue-collar workers, as defined by the DOL, are those with probability codes of 0, indicating that no worker in that occupation would pass the duties test in order to be exempted from overtime protections. Hourly workers are all workers who are paid on an hourly basis (only those hourly workers who are in named occupations are not dropped). Workers who make at or above the salary threshold and meet the “duties tests” that define them as executive, administrative, or professional (EAP) are exempt, i.e., ineligible for automatic overtime pay. The occupation groups dropped here represent those FLSA section 13(a) and 13(b) occupations that are automatically exempt from overtime protections. See the technical appendix for more detailed information on what occupations are included in agricultural, transportation, and other occupations. c. We effectively drop non-EAP-exempt workers here by multiplying workers' weights by the midpoint probability code that is assigned to their occupation. Workers with weekly earnings less than $455 per week (in 2013 or 2014) are dropped from the sample as they are already legally entitled to overtime protections by virtue of the current salary threshold. d. Those workers in named occupations, or occupations that are not subject to the salary test (teachers, academic administrative personnel, lawyers, medical professionals, and outside sales workers), are dropped. See the technical appendix for more detailed information on how we identify these occupations. e. Workers with weekly earnings less than $455 per week (in 2013 or 2014) are dropped from the sample as they are already legally entitled to overtime protections by virtue of the current salary threshold. The DOL reports a total of 144.2 million “wage and salary workers”2 at the top of the chart. Unfortunately, the DOL data descriptions sometimes cause confusion because they do not follow those of the Bureau of Labor Statistics (BLS). That is the case with ”wage and salary workers”—a category that in BLS’s terminology would encompass total employment, including both wage and salary workers but also self-employed workers and unpaid family workers. Restricting the sample only to those who are employed),3 we estimate that there are 143.9 million wage and salary workers, which is reasonably close to the DOL estimate. Contrary to earlier analyses by EPI, we now include both part-time and full-time workers. Previously, we limited our analyses to full-time workers under the presumption that they are most likely to be affected by a salary change but we follow DOL’s lead and include part-time workers as they are technically eligible for overtime protections. As a result of this change, the number of people possibly covered by the different salary thresholds rises because part-time workers tend to earn less than full-time workers. However, this does not dramatically affect the change in the number of workers covered (the number covered under the proposed threshold minus the number covered under the current threshold). Step A reflects the fact that rules regarding overtime and the minimum wage apply only to those workers who are subject to the Fair Labor Standards Act. Self-employed workers, unpaid workers, religious workers, and most federal employees4 are not subject to the FLSA so we exclude all of those workers. Our computations remove more workers as not being covered by the FLSA than are subtracted under DOL’s computations (18.6 versus 15.7 million). Relative to the DOL, we remove 2.7 million more self-employed or unpaid workers from the estimate of workers covered by the FLSA. We also remove slightly more religious workers (24,000 more) but fewer federal workers (240,000 fewer). Our analysis also attempts to remove those persons with implausibly low or high wages.5 These wage exclusions amount to removing 421,000 workers, or 0.3 percent of our wage and salary workers, because their wages are not accurately captured by the MORG data. It is important to have a sample with an accurate wage measure for assessing how many workers earn below particular salary thresholds. Next, we narrow the sample to those workers to which overtime rules are applicable, salaried “white-collar”6 workers. Hourly workers are eliminated because they are paid on an hourly basis and by virtue of that alone, are guaranteed overtime pay. Workers with a zero probability of being EAP workers based on their duties, labeled as “blue-collar workers” by the DOL, are also removed from the sample. (Conversely, the term “white-collar” workers as used in the DOL’s NPRM actually includes blue-collar salaried workers, such as first-line supervisors/managers of mechanics, installers, and repairers. Thus, when the DOL describes “white-collar” workers they are really referring to “salaried workers.”) Beyond removing blue-collar and hourly workers, we remove workers from certain occupation/industry groupings that are automatically exempted from overtime provisions per sections 13(a) and 13(b) of the FLSA.7 Appendix A of the DOL’s NPRM outlines these exempted occupations. Despite starting at different levels of workers subject to the FLSA, we arrive at approximately the same level of salaried white-collar workers as the DOL (43.3 million versus their 43.0 million). We next remove those workers who are already legally entitled to overtime protections either because they earn less than the current salary threshold ($455) or their duties are not categorized as executive, administrative, or professional, leaving only those who are EAP exempt. In order to predict which workers qualify for the duties exemption, we employ the exemption probability tables created by the Department of Labor in 1999. The codes and the corresponding EAP exemption probabilities can be found in Table 2. The lower and upper bounds reflect the chances that workers in a given occupation perform executive, administrative, or professional duties. We simply use the midpoint of the lower and upper bound for each probability code. Each detailed occupation is assigned that midpoint probability code which would make them currently exempt/ineligible for overtime (and thus, able to be made eligible for overtime under the new salary threshold which supersedes the duties test). For example, if a given occupation falls in probability code 2, we would reduce their representation in our sample by 30 percent.8 Approximately 13.5 million workers are dropped from the sample because they are not EAP exempt, i.e., they are already considered to be legally entitled to overtime pay. An additional 1.1 million workers already qualify for overtime by virtue of the current salary threshold alone (i.e., they earn less than $455 a week in wages). Thus, step C removes 14.6 million workers from the total in 2013, according to EPI calculations. The FLSA also specifically exempts a select list of workers in certain industries and occupations from coverage. These workers include teachers, academic administrative personnel, physicians, and lawyers. In the DOL NPRM, these workers are identified as those in “named occupations.” We will henceforth refer to this group as those in named occupations.9 In the group of salaried white-collar workers, we estimate that approximately 9.5 million people worked in named occupations. However, because these workers are eligible to receive overtime pay if they do not satisfy the duties test, we are left with just 8.1 million EAP exempt workers in named occupations. Named occupations are not subject to the salary test so we remove the 8.1 million from the sample to get the number of workers potentially affected by the proposed increase in the salary threshold. Our estimate of those “potentially affected” is 20.6 million, just slightly below DOL’s estimate of 21.0 million. The DOL proposal to index the salary threshold to the 40th percentile wage for full-time salaried workers would mean that the threshold would be set at $921 per week for 2013 (U.S. Department of Labor 2015b). Step E therefore involves removing those earning at or above $921 a week from the count of affected workers. Our analysis finds that about 5.0 million (4.999 million) workers would be, in DOL’s terminology, newly eligible for overtime protections. This is 300,000 greater than DOL’s estimated 4.7 million. Our estimate rises to 5.3 million when we analyze 2014 data. Therefore, half of the 600,000 difference between our 5.3 million estimate and the DOL’s 4.7 million estimate is simply that there was more employment in 2014 and the other half is unexplained. 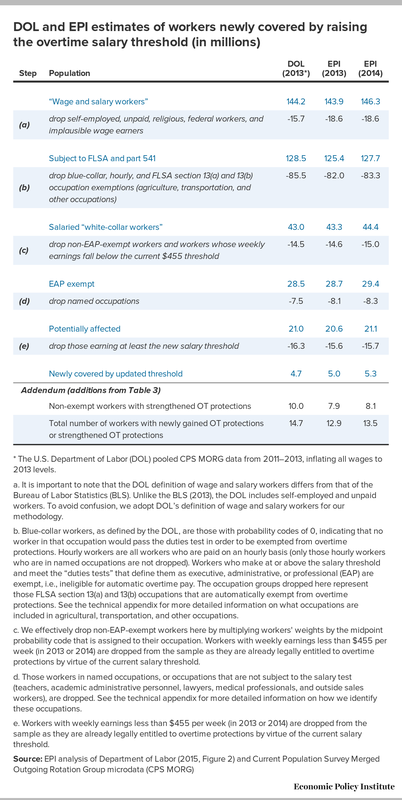 On top of estimating how many workers are newly covered by the proposed salary threshold alone, we also benchmark against DOL estimates by predicting the number of non-EAP-exempt workers who would “strengthen” their overtime protections with the salary update (Table 3). The DOL assumes that this group is already eligible and receiving overtime protections so that a higher salary threshold strengthens their current rights but does not expand eligibility. Our assessment is that most of these workers are not currently eligible for overtime because of eroded eligibility since the late 1990s and aggressive employer behavior in limiting overtime eligibility. We call them workers with “strengthened” rights in this paper as does DOL, in order to compare our results with DOL, but we actually consider most of this group to be newly eligible for overtime as well. Again, we benchmark our results to those of the Labor Department’s by comparing the DOL’s estimates to ours for 2013 and 2014. For the purposes of benchmarking our analysis to DOL’s 2013 numbers, we will reference our 2013 estimates throughout these steps. * The DOL pooled CPS MORG data from 2011–2013, inflating all wages to 2013 levels. a. Hourly workers are all workers who are paid on an hourly basis (only those hourly workers who are in named occupations are not dropped). Workers who make at or above the salary threshold and meet the “duties tests” that define them as executive, administrative, or professional (EAP) are exempt, i.e., ineligible for automatic overtime pay. The occupation groups dropped here represent those FLSA section 13(a) and 13(b) occupations that are automatically exempt from overtime protections. See the technical appendix for more detailed information on what occupations are included in agricultural, tnansportation and other occupations. b. Named occupations are those occupations that are not subject to the salary test. They include teachers, academic administrative personnel, lawyers, and various medical professions. See the technical appendix for more detailed information on how these occupations are identified in the data. c. Workers who make at or above the salary threshold and meet the “duties tests” that define them as executive, administrative, or professional (EAP) are exempt, i.e., ineligible for automatic overtime pay. d. Workers with weekly earnings less than $455 per week (in 2013 or 2014) are dropped from the sample as they are already legally entitled to overtime protections by virtue of the current salary threshold. e. Workers with weekly earnings of at least the proposed threshold ($921 for 2013, $933 for 2014) are dropped from the sample as the proposed threshold would not cover them. Next we drop all workers in named occupations (9.5 million), bringing us to 42.0 million workers. Next, we take the inverse of the values of the probability codes (see the last column of Table 2) in order to narrow the sample to those who fail the duties test (and are therefore legally entitled to overtime protections via the duties test). We drop 21.7 million workers (or our EAP-exempt workers not in named occupations) to yield 20.3 million. Dropping those who earn less than $455 per week or at least $921 per week, we estimate that 7.9 million workers would have their overtime protections strengthened. This is substantially below the DOL estimate of 10.0 million for this group. We have not been able to explain this difference. Adding this 7.9 million to our 5.0 million, we estimate that approximately 12.9 million workers would have benefitted directly by the update to the salary threshold in 2013, either by newly receiving overtime pay eligibility or by having their overtime protections strengthened. Our assessment is that most of this group would have been newly eligible for overtime because the probability codes estimated in 1999 provide a far too inclusive view of overtime eligibility in today’s workplaces (see The New Salary Threshold Would Directly Benefit 13.5 Million Workers: How EPI’s Estimates Differ from the Department of Labor’s, for details on the erosion of overtime eligibility since the late 1990s). The comparable estimate for 2014 would be 5.3 million plus 8.1 million which totals 13.5 million (when rounded to the nearest 100,000). We restrict the sample of affected workers to those who work for a public or private employer, thereby excluding self-employed workers (incorporated and unincorporated) as well as unpaid workers. These workers are identified by their class of work. Also excluded from the FLSA are most federal workers and all religious workers. Per the DOL NPRM, three categories of federal workers are subject to the FLSA: postal workers (identified as those in industry 6370—“Postal Service”), Library of Congress employees (identified as those in industry 6770—“Libraries and archives”—and living in the District of Columbia), and Tennessee Valley Authority workers (identified as those in industry 570—“Electric power generation, transmission and distribution”—and residing in Kentucky, Tennessee, Mississippi, Alabama, Georgia, North Carolina, or Virginia). Religious workers are identified as those in the following occupation categories: 2040—“Clergy,” 2050—“Directors, religious activities and education,” and 2060—“Religious workers, all other.” On top of these restrictions, which generally follow the process outlined by the DOL in their analysis, we remove workers with implausibly low or high hourly wages, indicating mismeasurement. We employ the approach described in Appendix B of The State of Working America with the updated wage boundaries (for 2014, the lower bound is $0.92/hour and the upper bound is $184.33/hour). We mostly follow the sample specification detailed by the DOL in Appendix A of the NPRM to identify and remove those industry-occupation combinations that are exempt from overtime protections per sections 13(a) and 13(b) of the Fair Labor Standards Act (U.S. Department of Labor 2011). Section 13(a) of the FLSA exempts groups of employees from both minimum wage and overtime rules. Section 13(b) exempts groups only from overtime protections. Among the 13(a) exemptions, agricultural workers are the largest group. They are identified as working in the industries 170—“Crop production,” 180—“Animal production,” and 290—“Support activities for agriculture and forestry,” and working in any of the following occupations: 20—“General and operations managers,” 205—“Farmers, ranchers, and other agricultural managers,” and 6005—“First-line supervisors of farming, fishing, and forestry workers.” Other exempt groups from section 13(a) are seasonal amusement and recreational establishment workers (provided certain characteristics of their employer), fishermen, small newspapers, switchboard operators, seamen on foreign vessels, companions, criminal investigators, and computer workers. Will Kimball joined EPI in 2013. As a research assistant, he supports the research of EPI’s economists on topics such as wages, labor markets, macroeconomics, international trade, and health insurance. Prior to joining EPI, Kimball worked at the Center on Budget and Policy Priorities and the Center for Economic and Policy Research. He holds a B.A. in economics and political science from the University of Connecticut. Lawrence Mishel, a nationally recognized economist, has been president of the Economic Policy Institute since 2002. Prior to that he was EPI’s first research director (starting in 1987) and later became vice president. He is the co-author of all 12 editions of The State of Working America. He holds a Ph.D. in economics from the University of Wisconsin at Madison, and his articles have appeared in a variety of academic and non-academic journals. His areas of research are labor economics, wage and income distribution, industrial relations, productivity growth, and the economics of education. 2. The DOL includes self-employed and unpaid workers as “wage and salary” workers, which differs from the BLS (2013); to avoid confusion, we adopt DOL’s definition of wage and salary workers for the remainder of this document. 3. There are two possible employment responses that we include: employed and at work, and employed but not currently at work. 4. See the technical appendix section, “Workers subject to the Fair Labor Standards Act,” for more detailed information on how we identified these workers. 5. See Appendix B of the State of Working America (Mishel et al. 2012) for a more detailed explanation of these wage exclusions. 6. White-collar, as defined by the Department of Labor for this analysis, keeps those workers in occupations who have any probability code other than 0. 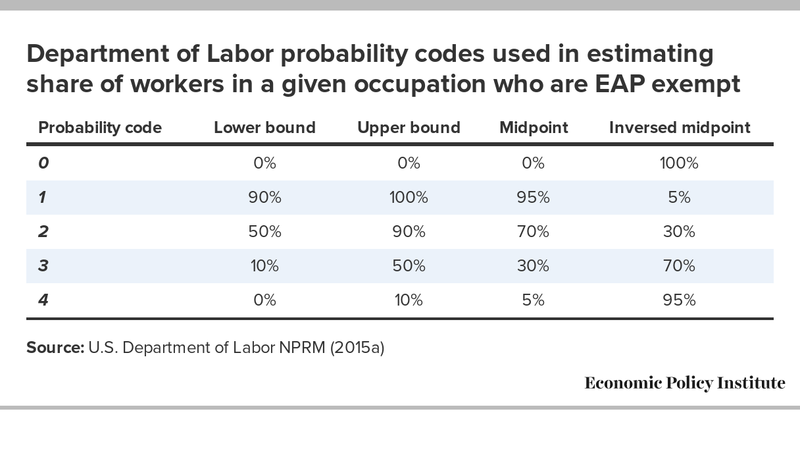 A probability code of 0 indicates that no workers in a given occupation would pass the duties test in order to be exempted from overtime protections. In other words, workers in those occupations should be getting overtime protection because their duties do not categorize them as executive, administrative, or professional. 7. Specifically, section 13(a) lists those that are exempt from both overtime and minimum wage protections whereas section 13(b) lists those that are exempt from overtime protections. See the technical appendix section “13(a) and 13(b) exemptions” for more detailed information on how we identify these workers. 8. We use the midpoint of the lower and upper bound estimates for the EAP exemption detailed in Table 2. We multiply one’s ORG weight by their probability value to effectively drop the representation of workers whose occupational duties likely make them non-EAP exempt. 10. Only “outside sales workers,” a subgroup of workers included in this occupation coding, are exempt under the FLSA. The DOL estimated that approximately 43 percent of this occupation category is outside sales workers. We employ that estimate and randomly assign exempt status to 43 percent of those in the occupation using a uniform distribution. Bureau of Labor Statistics. 2013. BLS Handbook of Methods, Chapter 1. Eisenbrey, Ross, and Lawrence Mishel. 2015a. The New Overtime Salary Threshold Would Directly Benefit 13.5 Million Workers: How EPI’s Estimates Differ from the Department of Labor’s. Economic Policy Institute Issue Brief #401. Mishel, Lawrence, and Ross Eisenbrey. 2015b. Raising the Overtime Threshold Would Directly Benefit 13.5 Million Workers: Here is a Breakdown of Who They Are. Economic Policy Institute. Mishel, Lawrence, Josh Bivens, Elise Gould, and Heidi Shierholz. 2012. “Appendices” in The State of Working America, 12th Edition. An Economic Policy Institute book, published by Cornell University Press. U.S. Department of Labor, Wage and Hour Division. 2011. The Fair Labor Standards Act of 1938, as Amended. WH Publication 1318. U.S. Department of Labor, Wage and Hour Division. 2015a. “Defining and Delimiting the Exemptions for Executive, Administrative, Professional, Outside Sales and Computer Employees.” (Notice of Proposed Rulemaking, pdf). 29 CFR Part 541. U.S. Department of Labor. 2015b. “Deciles of Usual Weekly Earnings of Nonhourly Full-Time Worker by Selected Characteristics, 2014 Annual Averages.” Research Series on Deciles of Usual Weekly Earnings of Nonhourly Full-Time Workers [Labor Force Statistics from the Current Population Survey].